The Tõrenurme sacred lime on the Tõrenurme village common in Põltsamaa parish in Jõgevamaa county. 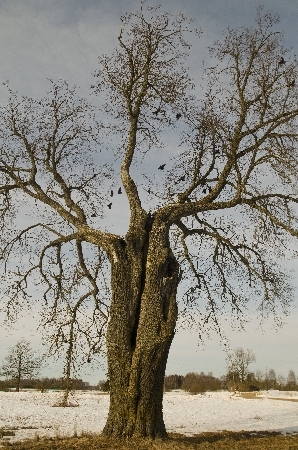 Hendrik Relve: “I visited the tree for the first time in 1999. At that time 78-year-old Kristiine Palm from Tõrenurme village told tales of the tree. It was said that in the old days dances were held under the tree. In Miku, the farmstead nearest to the tree, there was always water in drought periods – even when wells elsewhere in the village were dry“. Dear friends of photography and the ancient sites: we look forward to your photos from Estonia’s oldest nature protection areas and sites. Until the end of the Mud Month (until 31.10. ), Maavalla koda looks forward to photos of historical sacred sites in nature that may be single sacred trees, wells, rood trees and other revered places in nature. Photos may show gifts brought to the site and healing objects, people seeking strength at the sites, leaving gifts, healing, making fires, taking counsel or following other traditional practices. Traditional customs are for instance collecting water from healing wells, leaving coins on sacrificial stones and also seeking strength in the sacred sites. On the sadder side the images may catch the defiling of sacred sites, the wrecking and its traces. In addition to the grand prize a number of special awards wait to be distributed in the groups trees, stones, water, protected species, gifts, grove customs and pain. The main award for youth (up to 16 years) is set up by the Ministry of Education and Science. The National Heritage Board (Muinsuskaitseamet) this year presents an award for the best photo of a natural sacred site protected as a historical cultural site, photographed by school students. The Võro Institute once again provides an award for the best image of an Old Võromaa sacred site. Nature photographer Arne Ader, artist Epp Margna, Maaleht journalist Sulev Oll and Tartu kõrgema kunstikooli photogrpahy teacher Toomas Kalve are in the competition jury. The winners will receive the prizes on 19.11. in the Estonian Literary Museum (Eesti kirjandusmuuseumis) in Tartu at the Recognition ceremony for the power of the groves (Hiie väe tunnustamissündmus) there. Groves, sacred stones, wells, trees and other sacred objects and sites in nature are historically protected sites in Estonia. Their landscape and the biodiversity there has been protected already for thousands of years by the beliefs and traditions of our people.